Jinyoung Englund is a strategic advisor and international speaker on the economic, social, and political impact of Blockchain technology. A thought-provoking, informative and entertaining storyteller, Jinyoung specializes in equipping executives, elected leaders, and entrepreneurs with a holistic understanding of this new technology’s impact across various disciplines. 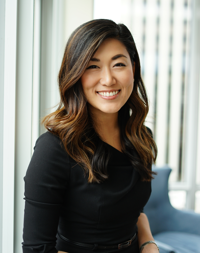 As the Director of Communications and Business Development for the world’s first trade association representing the Bitcoin and Blockchain ecosystem, Jinyoung served as global spokeswoman and oversaw communications, strategic partnerships, and external relations. She has been mentioned in the Wall Street Journal, Bloomberg, New York Times, CoinDesk, Korea Times, Politico, and CNN Money. Jinyoung has also been recognized as one of the “Top 40 Women in Bitcoin” and “31 Women Strengthening the Connection Between Finance and Technology.” Jinyoung is the Founder and Managing Director of Fé Ventures, a consultancy that educates executives on blockchain technology, designs strategies and develops partnerships. Jinyoung’s capacity for connecting disparate ideas stems from experience that spans across four continents and the nonprofit, private and public sectors. She co-founded a water well drilling initiative in Southeast Africa, served on a U.S. presidential transition team, directed the first and largest international conference for Bitcoin and Blockchain in the Netherlands, co-led an award-winning app development team for the U.S. Marine Corps in the Pacific and most recently, raised a record-setting $1.6 million dollars in 6 months and walked over 1.5 million steps knocking on over 17,000 doors for her WA state senate campaign. Jinyoung and her husband, an active duty U.S. Marine, are proud residents of the great state of Washington. Ann Norman stood in for our absent president, Kaj Pedersen, who is undoubtedly off on some grand adventure. Jenny gave a lovely invocation for Good Friday and the beginning of Jewish Holiday Passover. Here s a summary of what she said. in Rotary we celebrate people of all faiths, and people who struggle with any faith in a higher power. Under the banner of “Service Above Self” we are grateful for the fellowship, friendship and community of Rotary. Kim Schrader led the introduction of guests, and it took a while since there were 15 guests today! Laura Cosacchi introduced four (4) lively RYLA participants. They gave a great presentation with powerpoint on their experience in Rotary Youth Leadership Awards for 2018. They were accompanied by their proud parents at our meeting. 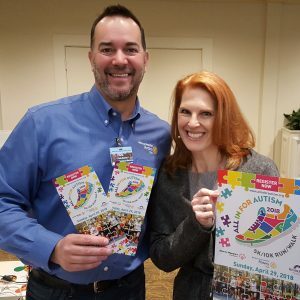 Chris Boland and Wendi Fischer Getting the Word Out for All in for Autism! Chris Boland gave us a pep talk about getting the word out for runner registrations. Rack cards and posters are here for the taking. Wendi Fischer had signup sheets for suggested places to take the rack cards and posters. She also solicited verbal signups which Chris duly noted. 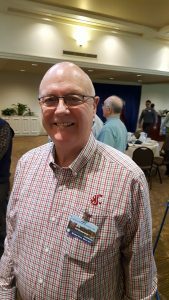 Dennis Newell squeezed his rubber Ducky to make a call out for last minute signups for the BBRC Retreat May 4-5 at Leavenworth. John Schwager supported him with some information about the accommodations.